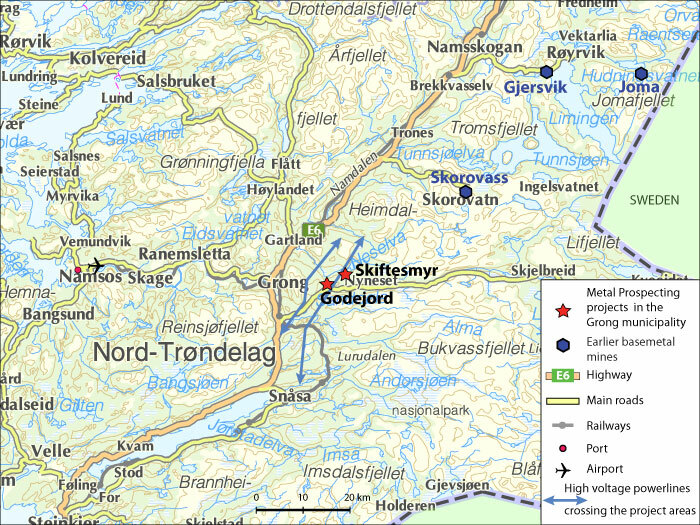 The deposits Skiftesmyr and Godejord are located in the Grong municipality, with some 2,600 inhabitants. Grong is located in the Nord-Trøndelag County, having about 130,000 inhabitants. Trondheim, counting about 168,000 inhabitants, is situated approximately 200 km to the south. The area has paved local roads and is close to the E6 highway, Norway’s principal N-S highway. The roads to the deposits are covered with gravel and parts of them may require reinforcement for carrying traffic to and from the mines. Ore concentrates will be trucked on the main road 760 to the port of Namsos. Additional roads to the deposits over a distance of about 0.5 km will be built. There is also a railway in the area as well as an airport. The Namsos port is situated only 80 km from Skiftesmyr and Godejord. It can accommodate container ships up 15-20,000 gross tons and bulk ships up 18-22,000 gross tons, which is sufficient for transporting MetPro’s products. The harbor has good storage areas. Former mines in Grong shipped their concentrates from this harbor. There is a hydroelectric power station, Nord-Trøndelag Elektrisitetsverk, two km from Grong. Access to industrial as well as domestic drinking water is in general no problem in Norway, having a large number of rivers and lakes. All municipalities offer access to municipal pure water supply. Nearby to the north and east of Skiftesmyr and Godejord there are lakes and rivers. The river Sandøla passes a few hundred meters south of Godejord.